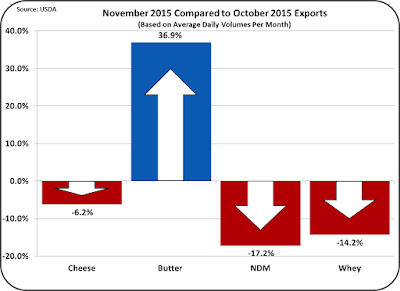 The first chart below shows the change in dairy exports November vs. October 2015. 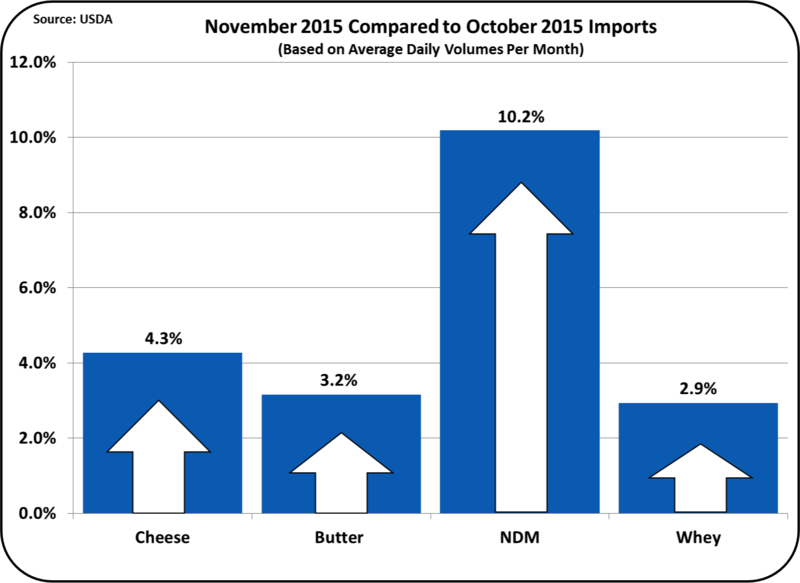 The only positive number is a 36.9% increase in butter exports. Unfortunately, the base is so small that the 36.9% is very small volume. The second chart shows increases in dairy imports for all four of the commodities underlying U.S. producer milk prices. 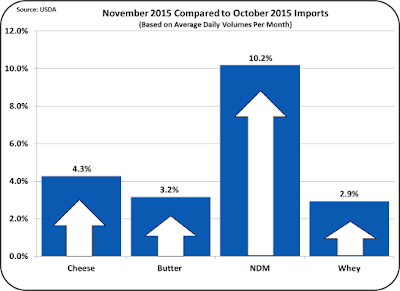 As will be shown in this post, the U.S. is becoming a net importer of dairy commodities. Low international prices create opportunities for dairy processors and wholesalers to buy their needs from sources outside the U.S.
Globally, there is more supply than demand for dairy products, and the strong USD makes U.S. dairy products more expensive compared to other dairy products available (more details on this below). 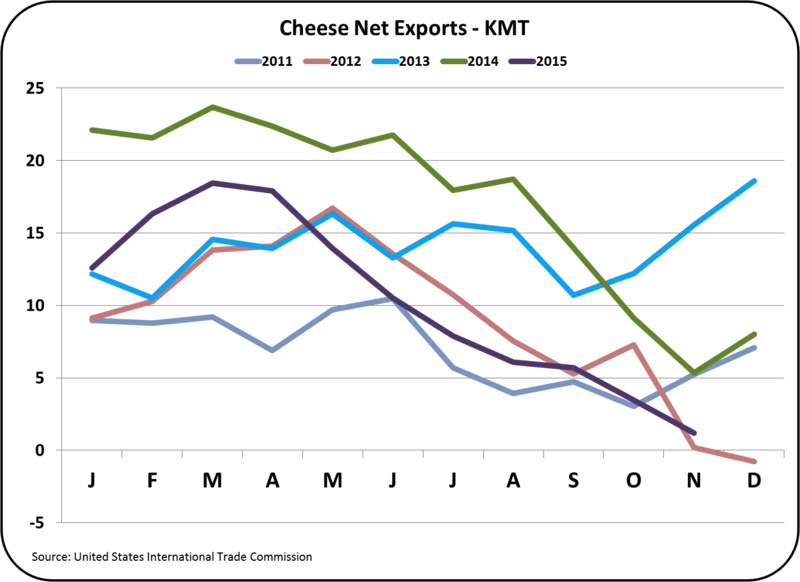 As covered in the prior post, cheese inventories are increasing because exports are falling short of prior levels. 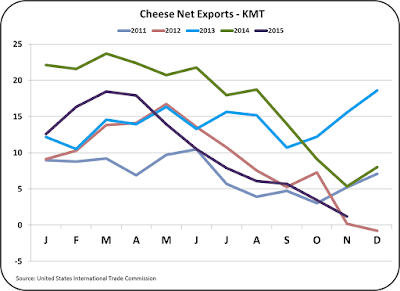 The three charts below show the declining cheese exports and the increasing cheese imports. 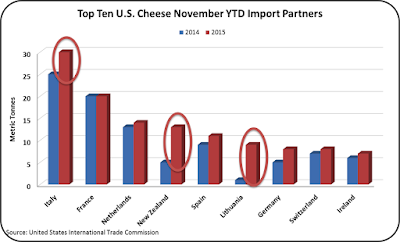 Together, they are bringing net cheese exports to near "0". 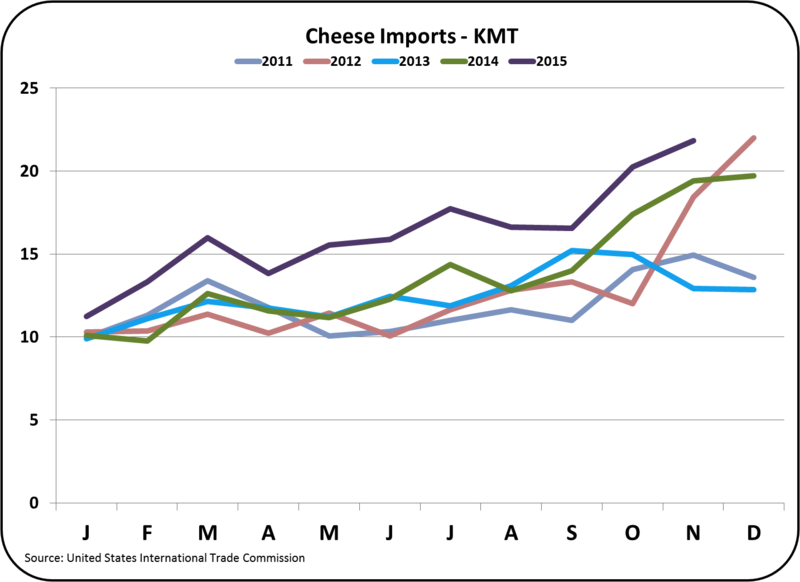 If cheese producers continue producing at current rates, the inventories will continue to grow. The Class III price is closely linked to the price NASS price of wholesale cheese. The price of cheese largely determines the price producers get for their milk. 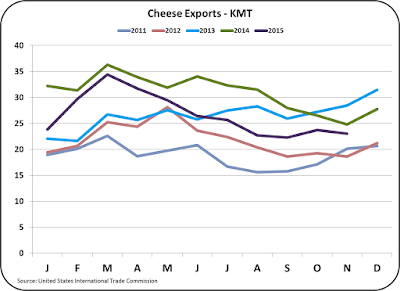 Therefore, cheese supply and demand and international cheese pricing should be followed closely, especially if one is hedging forward milk prices. The natural and American cheese inventories were covered in the prior post, and showed a concerning build in inventory levels. 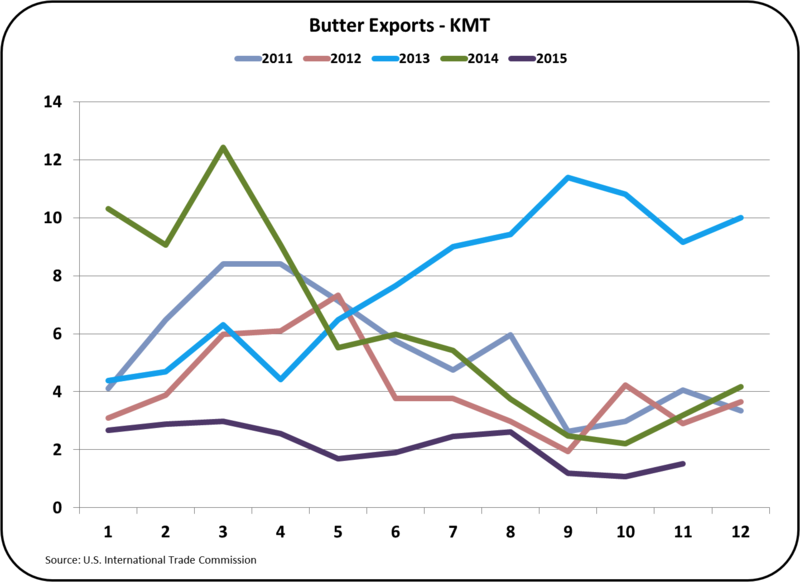 Butter exports and imports show a similar picture. 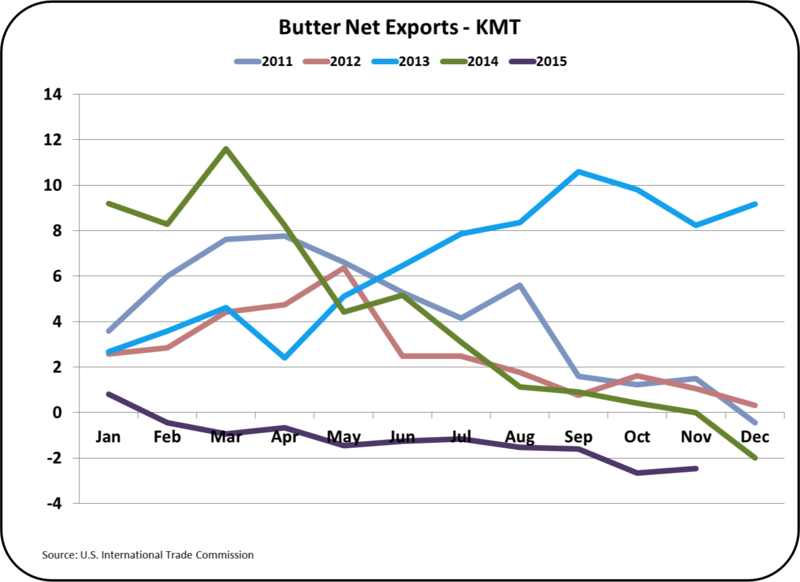 Butter exports are near "0", and imports continue to grow. 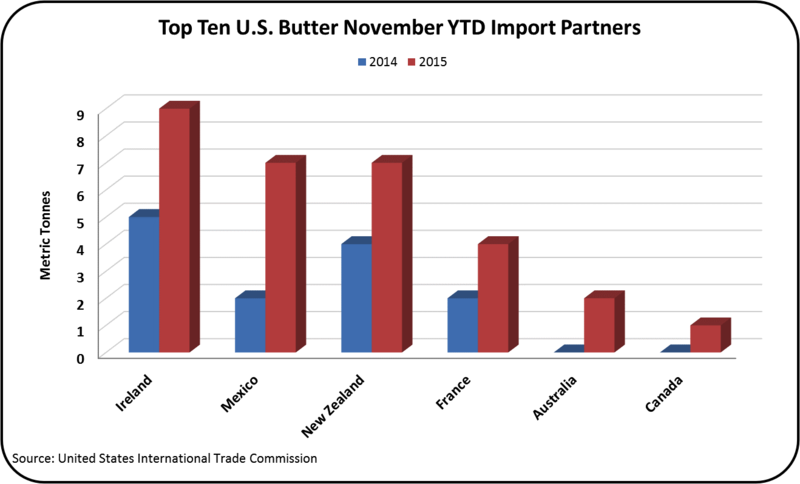 The U.S. has been a net butter importer since the first quarter of 2015. 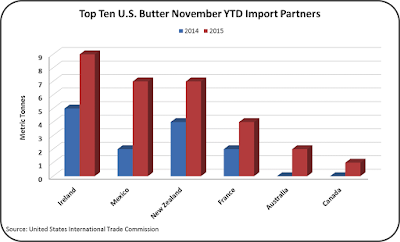 The global price of butter is nearly half the price of U.S. butter. 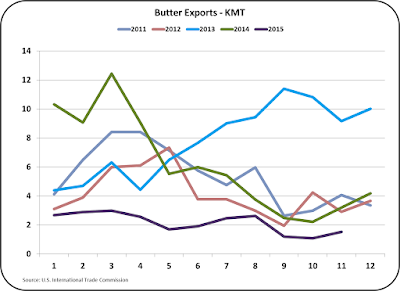 So of course, there are no buyers for U.S. butter at domestic prices. When butter is needed to meet domestic demand, it is imported at bargain prices. Nonfat dry milk and dry whey (the other two dairy commodities that influence producer milk prices) are largely export items, and their prices follow the international prices. Inventories are not out of line. Nonfat dry milk exports are not off terribly from prior years. Dry whey is off, but inventories are stable. 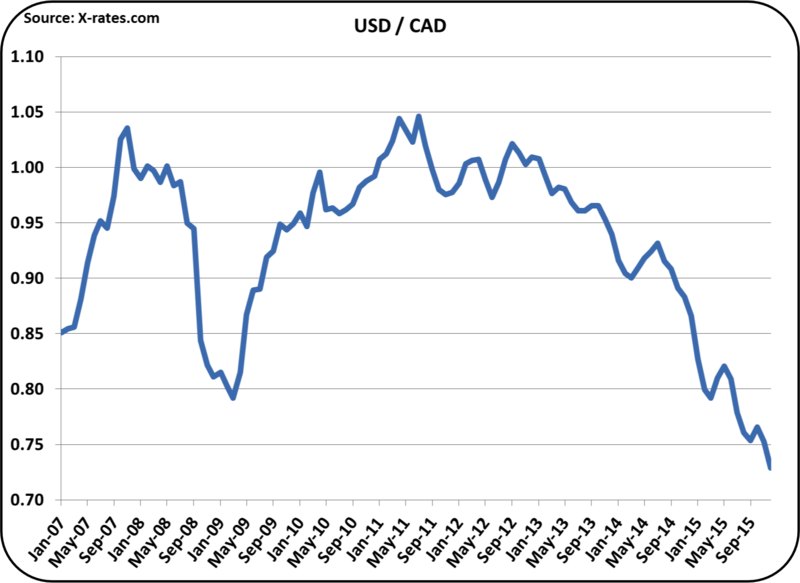 For those reasons, this post will remain focused on cheese, butter, and exchange rates. 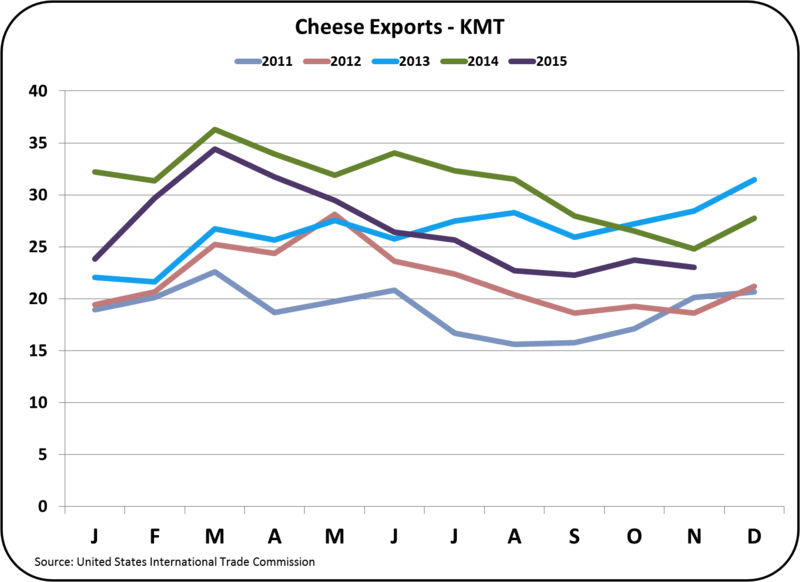 Exports of cheese to Mexico are up YTD, but cheese exports are down for all other major countries. 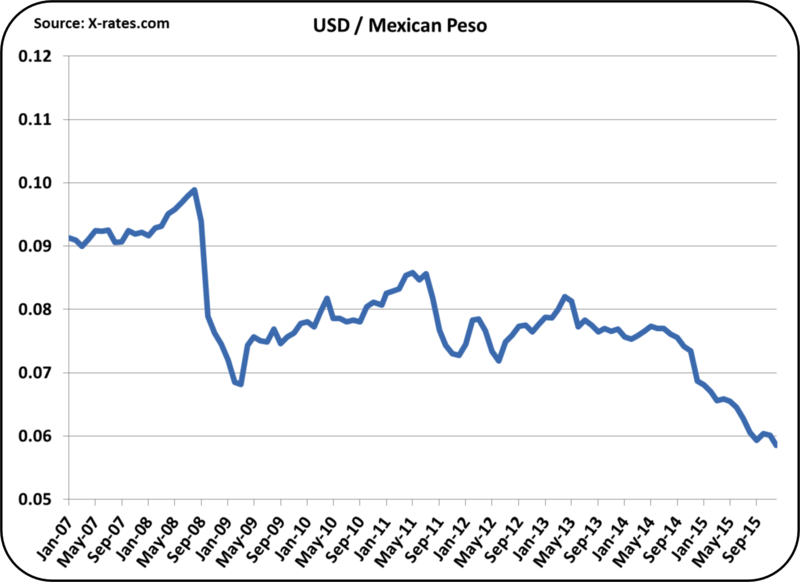 It makes sense because Mexico is geographically close to the U.S., so freight is low. Also, branded products known in the U.S. are known and favored by consumers in Mexico . 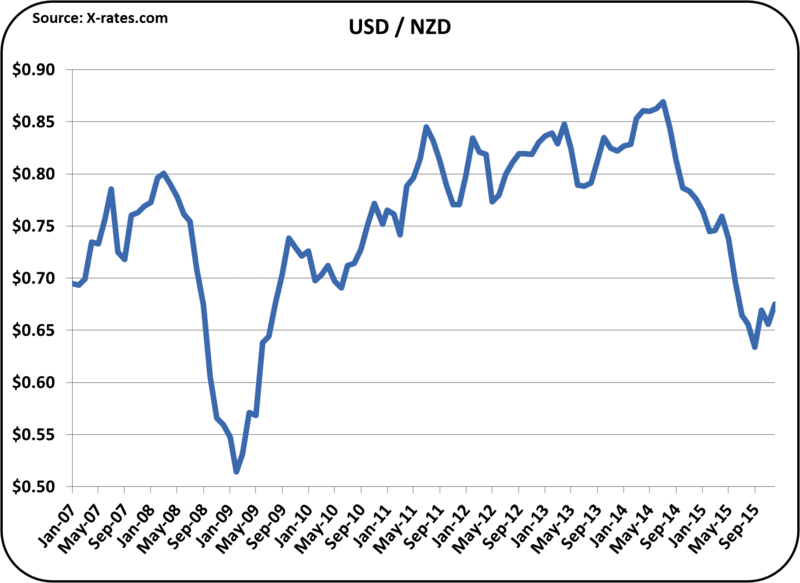 Sales to Japan and South Korea have dropped significantly because these countries are close to other major suppliers like New Zealand. 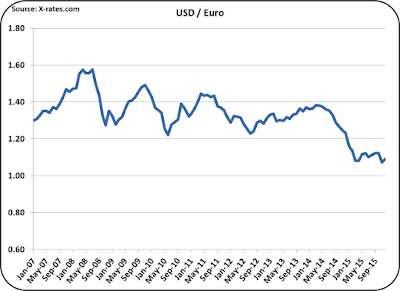 Exchange rates, covered below, also have a major impact. 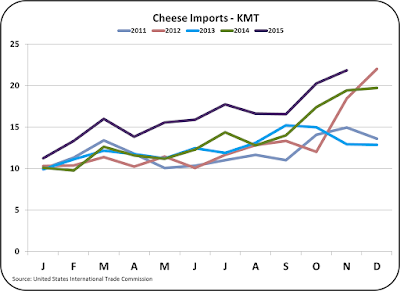 Cheese is being imported from many countries, but the 2015 increases come primarily from Italy, New Zealand, and Lithuania. As long as there are excesses in these countries and prices are low, they will find their way to U.S. cheese processors. 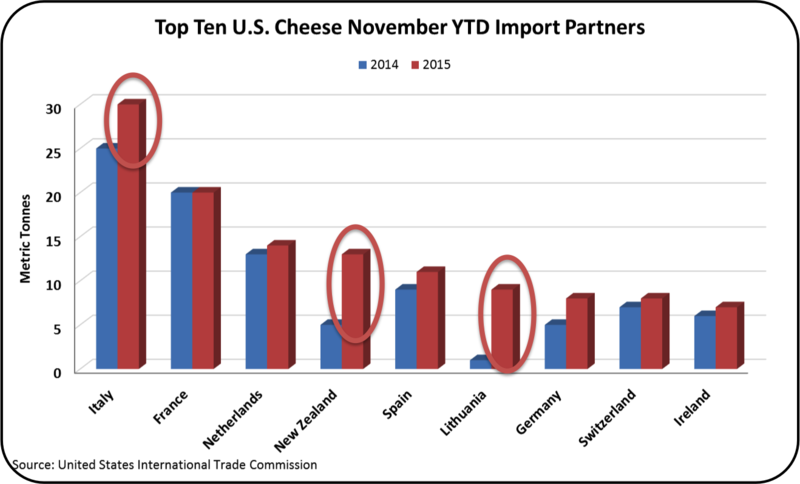 Specialty cheeses from France are common in the U.S., but imports are unchanged from prior years. 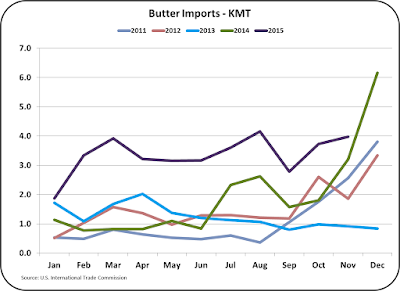 As the demand for butter in the U.S. is increasing, that demand is being filled with imported product. The chart below shows the biggest import partners; Ireland, Mexico, New Zealand, France, Australia, and Canada. Imports from all are up significantly. 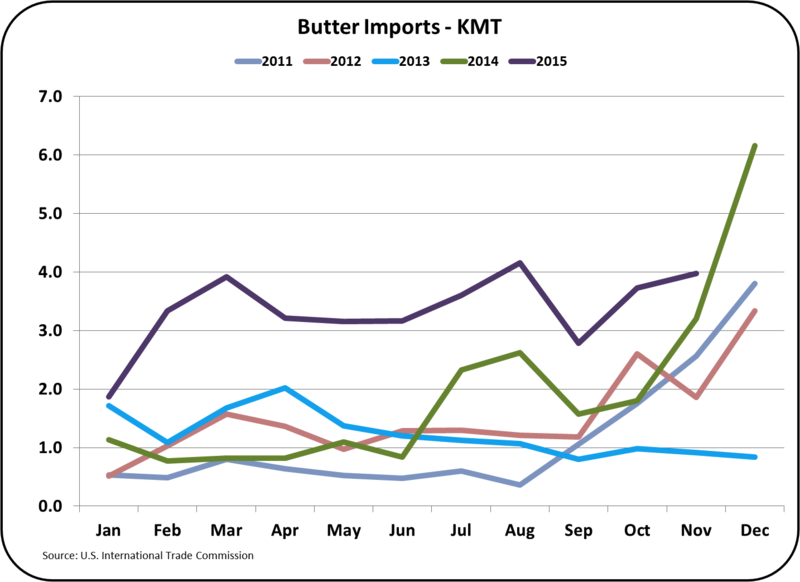 As long as cheaper butter is available from other countries, it will be used to satisfy domestic U.S. demand. It is unlikely that additional churning capacity will be built to meet domestic demand as there is no ROI for new facility investment. 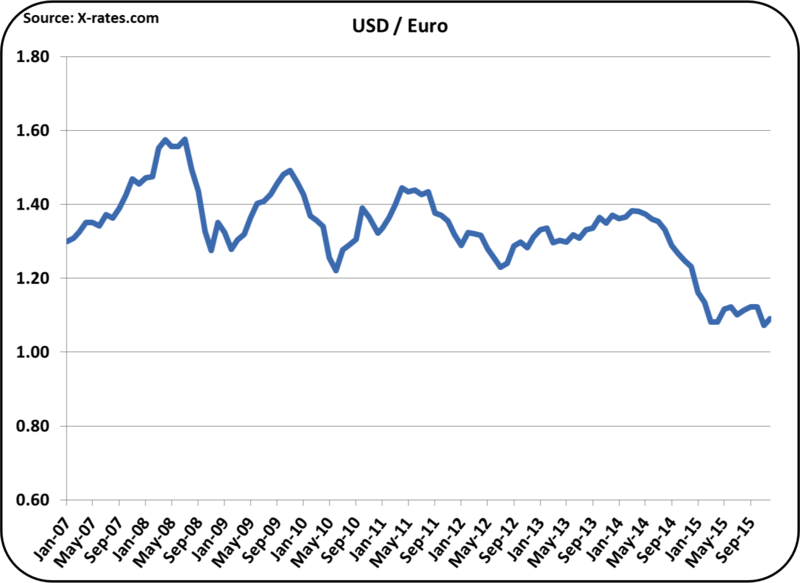 When the USD is strong, U.S. produced products are more expensive compared to products from countries with weak currencies. 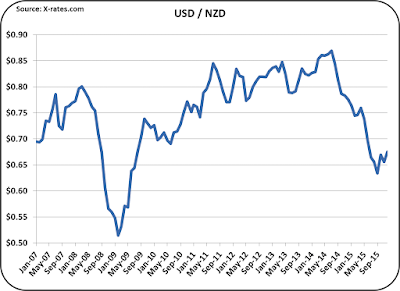 The charts below show the USD compared to the Euro and the New Zealand dollar. Europe and New Zealand are two of the major dairy exporting regions. 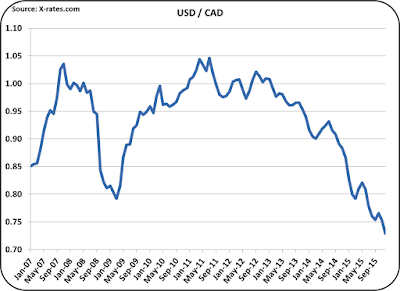 As can be seen, there is no current trend showing any reversal of these exchange rates. For that reason, any major increase in exports is unlikely. Mexico and Canada are the geographically closest import/export partners. Mexico has always been the largest importer of U.S. dairy products. 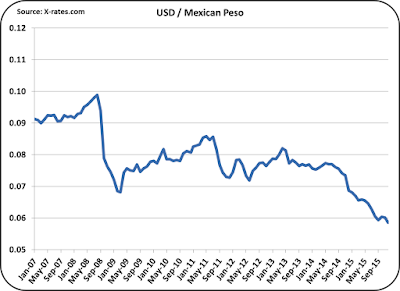 In both Mexico and Canada, product from the U.S. has become about 30% more expensive due to the strengthening USD. 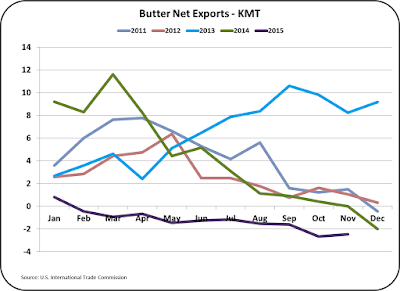 There is no reason to expect any near term change in dairy exports. 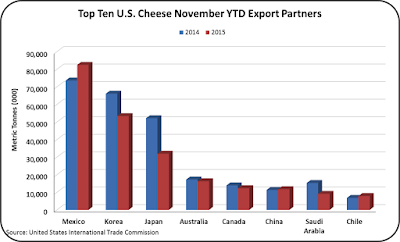 As mentioned in the prior post, in order to keep U.S. cheese inventories in line, cheese production must be reduced. Changes to these concerning current conditions will be followed in this blog.